YANG JINSONG, a leading Chinese painter from the Chong Qing municipality, in his studio in the Fei Jia Cun Artist Village in Beijing, China. 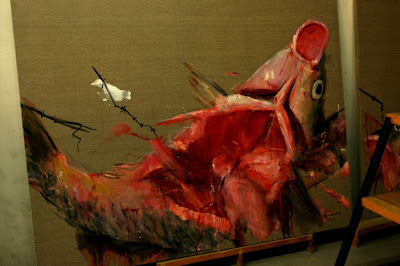 Yang explains his 'consumerist-critical' paintings depicting fish, traditionally a symbol of wealth in Chinese culture, critique China’s construction boom and over-development by depicting bulldozers infesting the fish’s gutted innards. 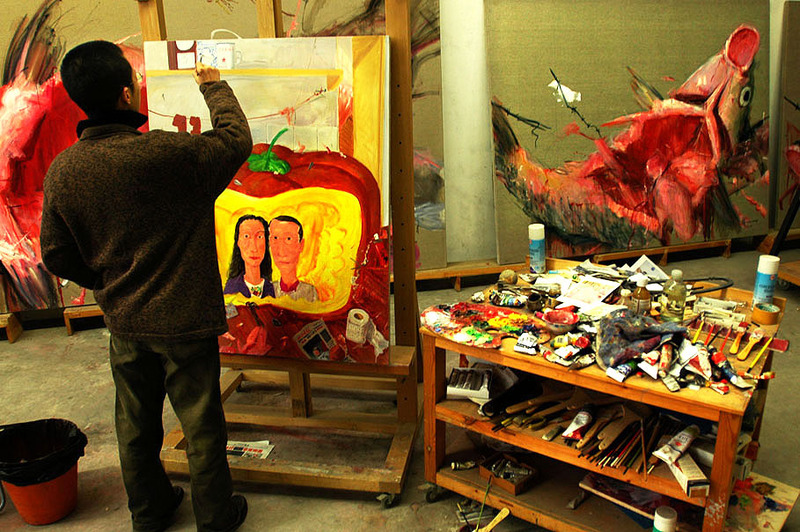 Yang often paints himself with his wife, She Cai, surrounded by emblems such as pollution, electrical appliances, and cigarette butts (2nd image, center painting), symbolizing China’s rapid development and embrace of consumerism.